Imec announces that it has successfully printed first Extreme-Ultraviolet (EUV)-light wafers with the ASML NXE:3100 preproduction scanner using XTREME technologies (a wholly owned subsidiary of Ushio Inc.) Laser assisted Discharge Plasma (LDP) source. The tool shows significant improvement in throughput and overlay compared to ASML's Alpha Demo Tool (ADT). The mechanical installation and setup of the ASML NXE:3100 started March 1st, 2011 and site acceptance tests were completed within the scheduled timeframe. The ASML NXE:3100 is interfaced with a TEL Lithius Pro EUV process track. It is currently the only preproduction tool in the world equipped with a laser assisted discharge plasma (LDP) source from XTREME technologies. The NXE:3100 leads to much higher wafer throughput compared to the ADT. The source power is expected to scale to 100 Watts by early 2012, increasing the scanner throughput from the current level to 60 silicon wafers (300mm) per hour. The exposure rate of the NXE:3100 today is already 20 times faster than that of the EUV ADT. A first test of dedicated chuck overlay showed the potential to achieve the <4nm target, which is significantly better than the ADT. The NXE:3100 integrates 4 image and 4 dose control sensors which were developed within imec's CMORE development and prototyping service. Installation of these new sensors combined with new wafer tables made both chucks equivalent for overlay, enabling full twinstage-type operation. At the same time, off-axis illumination options have been installed, which at factory acceptance have proven to resolve sub-20nm features using dipole illumination. "The availability of the NXE:3100 at imec is an important milestone in our Advanced Lithography program as it will enable the next phase of the EUV program to focus on manufacturability, aside from further infrastructure related studies on masks, resists and design correction;" said Luc Van den hove, President and CEO of imec. "We are excited with the current results and throughput we achieve. Our decision to implement the LDP source from XTREME technologies is an important added value for our partners since it allows them to test both our LDP (laser assisted discharge plasma) and the LPP (laser produced plasma) sources currently installed at other sites. We are convinced that our program will bring significant contributions to bringing EUV to mass manufacturing for the 16nm node by 2013." "We are pleased that imec has joined the ranks of customers which have started exposing wafers with ASML's second-generation EUV tool," said Ron Kool, ASML Senior Vice President EUV. "The work at imec exemplifies the strong industry momentum behind EUV and will help prepare the ground for the introduction of EUV into high-volume manufacturing." 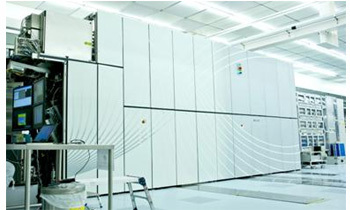 "Jointly with ASML and imec, our teams have worked hard to install the first LDP EUV source," said Marc Corthout, president of XTREME technologies. "We are pleased to be partnering with imec. Today is a major milestone in the advancement of EUV lithography. XTREME technologies' LDP light source will enable high-resolution and high-throughput EUV lithography used in the mass manufacturing of advanced ICs with critical dimensions below 22nm. XTREME technologies' LDP light source will thus enable the continuation of Moore's Law for multiple chip generations to come. Through its partnership with imec, XTREME technologies is committed to support the whole semiconductor industry in its transition to EUV", stressed Shiro Sugata, President & CEO of USHIO Inc. This work was executed in collaboration with imec's key partners in its core CMOS programs Globalfoundries, INTEL, Micron, Panasonic, Samsung, TSMC, Elpida, Hynix, Fujitsu, Sony and Powerchip.